The brotatoes, spudettes, and I wanted to update everyone on our progress in the past couple of weeks and our plans for the next few weeks. Before I get onto the nitty gritty details of the work we’ve been doing on We’re in Space, I just wanted to let everyone know that since GDC is coming up next week, we’ve been swamped working on a million and one things to prepare for it. 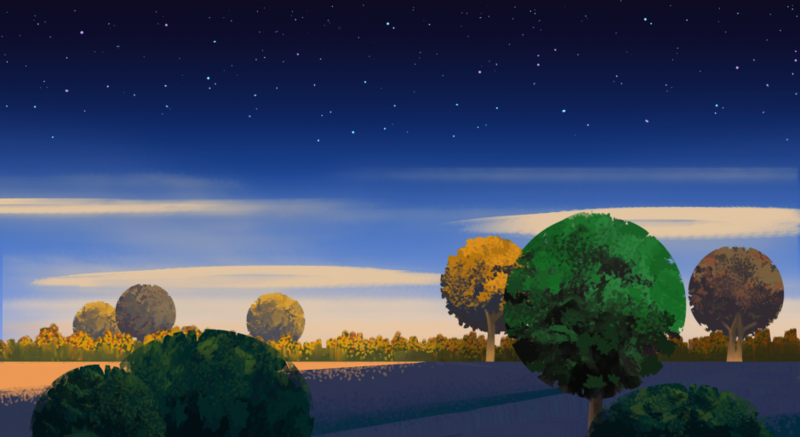 Our spud designers have been busy getting artwork done for GDC and so this post will most likely be word heavy instead of art heavy. Last week we finally got a playable battle prototype up and running! We got to see some battles taking place visually instead of just staring at numbers to see if things were balanced. I would have loved to include the prototype in this diary entry and show you guys some screenshots but its honestly way too early to show it off. Either way, the prototype looks good and feels good and it has given us so much invaluable information on how shields should or should not work and how animations should look and a dozen other things! I am hoping we can have a somewhat polished and playable battle prototype for GDC next week but its a lot of work to do in a short amount of time. 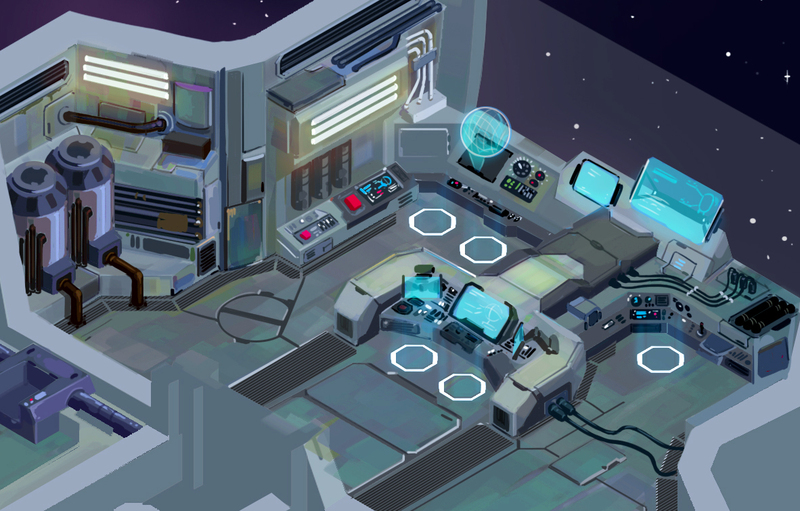 As for in-game art work and assets, Yeevon has been working super hard on getting the ship interior looking good and fleshed out, which is starting to look really neat! So far, she has the command center pretty much finished, which is where Cassie is going to spend most of her time being a captain and doing captain things. Besides the interior of the ship, Yeevon has also been working on how the ship exterior is going to look like. We went through a lot of different designs and what the ship should or shouldn’t look like. We wanted Cassie’s ship’s visuals to match the story behind how it got to where it is, and what we ended up picking is a ship that looks a little like it was constructed using a bunch of different scrap metal. It goes without saying that right now it is just a skeleton of what it will look like when it is finished, and so a lot of the ship’s character and feeling will be portrayed in its colour palette. We kinda felt like previous ship shapes were fishy looking and so we revamped it to a shape we really like! Lastly, Koko has been working on fleshing out some combat weapons that you will be able to craft for your ship. 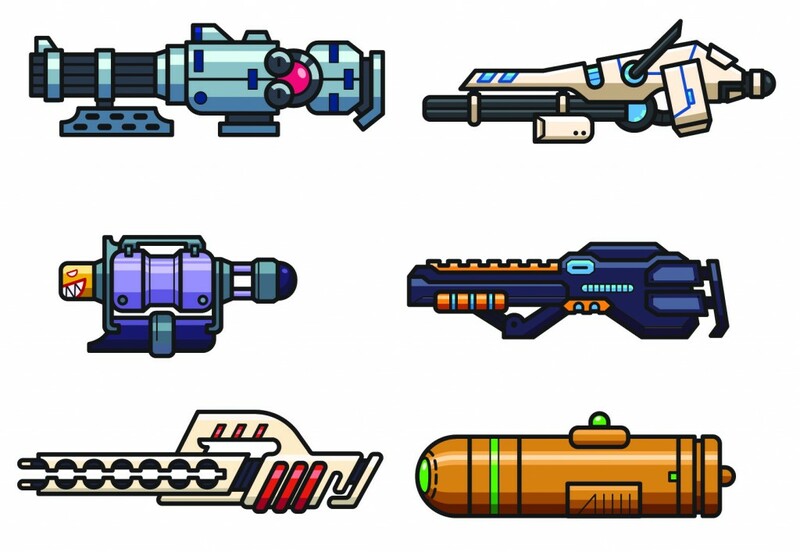 We have a bunch of designs in different colours but I picked out only a few so I don’t overwhelm you and spoil too many of the weapon looks. As always, we have been working hard on the development of Holy Potatoes! We’re in Space?! With this title being a sort of sequel to its predecessor, it has been a lot easier to make certain decisions while developing. For instance, a lot of players from Holy Potatoes! A Weapon Shop?! gave us a lot of feedback about what worked and what didn’t. One of the things people brought up was that the game was sometimes too “clicky” and the UI makes it feel like a mobile game. Honestly, it is partly true, due to the fact that we had only developed mobile games before HPAWS. For Holy Potatoes! We’re in Space?! though, we have taken all the feedback into account when deciding how to layout the UI or how information is displayed on the screen and what features should be included or are mandatory. All your feedback has been invaluable to us and I always appreciate people writing in and giving us suggestions! If anyone is in San Francisco next week and is planning to attend GDC or is in the neighborhood hit us up and let us know! We are always down to get a beer or a pizza (or both). We also have a lot of cool stuff to give away while we are there, such as posters, stickers, and temporary tattoos! 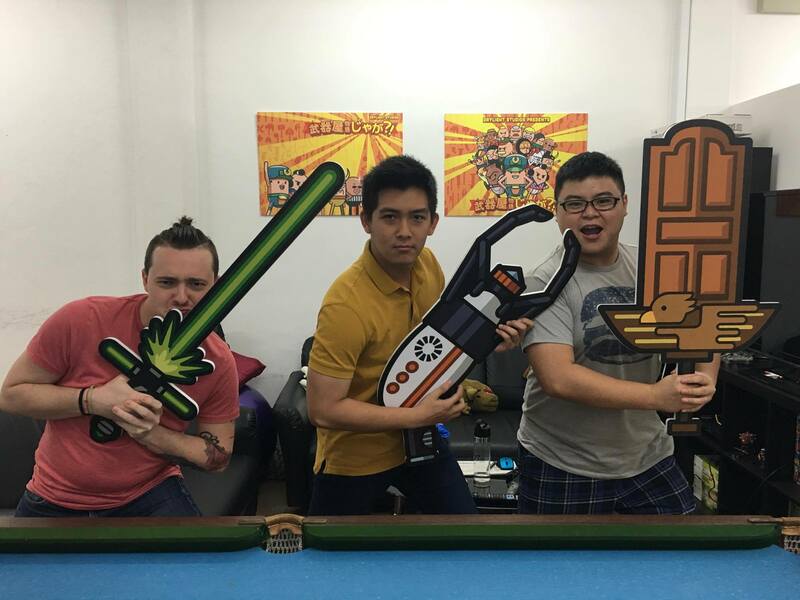 We also printed out some A1 sized weapons for anyone to take a picture with!